The Transport Minister spoke out about Ryanair’s bid to take over Aer Lingus this morning, saying the subject will be discussed at cabinet next week. 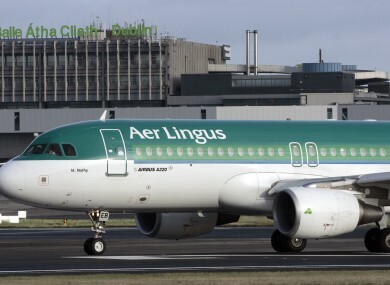 TRANSPORT MINISTER LEO Varakdar has said that the 25 per cent stake in Aer Lingus is for sale, “but it’ll be done at a time of our choosing, and for the right price”. The Minister made the comments on RTÉ’s Morning Ireland this morning, where he outlined three major concerns he has about the proposal yesterday from Ryanair that it buy Aer Lingus for €694m. Varadkar said his first concern related to competition law, as the European Commission had determined at an earlier date that Ryanair couldn’t take over Aer Lingus for competition reasons, while the UK is examining whether it can keep its existing stake. He also has a concern about what’s right for passengers, and whether giving any group a monopoly, or a near monopoly, on the routes out of Ireland is a good idea or not. His third concern is what’s best for taxpayers, and he said he has always taken the position that Aer Lingus is undervalued on the market, and this is proven by Ryanair’s bid. Varadkar commented that “45 per cent of [Aer Lingus] is freefloat, Ryanair can buy up some of that freefloat to the extent that it becomes majority shareholder”, but it would encounter trade investigations at that point. He concluded that the subject will be discussed next Tuesday at cabinet. Yesterday, the board of Aer Lingus said that it considers that Ryanair’s offer to pay €1.30 for the 70 per cent of shares it does not own“undervalues” it. This is Ryanair’s third bid for Aer Lingus, and the airline said that it believes circumstances have ‘changed materially’ since its first unsuccessful bid in late 2006. Email “Varadkar outlines concerns about Aer Lingus stake sale”. Feedback on “Varadkar outlines concerns about Aer Lingus stake sale”.